The holidays can be a stressful and even dangerous time for our cats. Normal routines are upset, visitors come and go, and overly tempting smells may be coming from the kitchen! The Christmas tree is the first item of great interest on your cat’s Santa list. Many cats find it irresistibly tempting to climb. First, make sure your tree is in a sturdy stand. Test it to make sure it’s tip-proof. Or put a hook in the ceiling and tie the tree to it (nylon fishing line works well and is nearly invisible) to be absolutely sure. 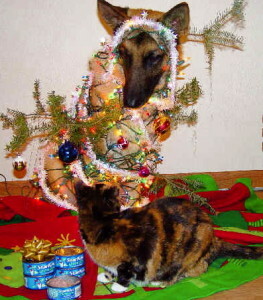 Read “A Cat-Proof Christmas Tree: It Is Possible” for more ideas. Keep glass ornaments to a minimum (if you must use them at all), and place them higher on the tree, with unbreakable ornaments lower down. Round ornaments may tempt a dog who likes balls. A broken glass ornament is a minefield for tender kitty paws. If a pet eats all or part of a glass ornament, immediately feed bread soaked in milk or cream; the soft mushy texture will gather up all the sharp pieces and safely expel them. Most tree stands have a water container—this is another hazard. Aromatic compounds from the tree itself and the preservatives often added to the water are highly toxic to pets. Make absolutley sure the container is wrapped and taped or otherwise made 100% inaccessible to your four-footed friends, who will often try to drink from this novel water source. Christmas lights and wires on the tree and around the home are an invitation to chew for both cats and dogs. For wires that are easily accessible to curious teeth (especially young animals), run them through inexpensive foam pipe insulators that you can find at any home improvement or hardware store. Metal tinsel is rare these days, but mylar can also pose a swallowing hazard. Its sharp edges can cause serious damage to a pet’s intestines. Consider a beaded garland instead. When unwrapping presents, make sure all ribbon and string is rounded up and safely disposed. Please, take it easy on the treats. Too many fatty treats like turkey skin or ham can cause serious tummy upset; in dogs especially, but in cats as well, these can trigger life-threatening pancreatitis. Ask dinner guests to refrain from feeding “under the table”—or even better, keep pets safely confined during the festivities. Chocolate, onions, grapes, and currants can cause serious harm to both dogs and cats. Lastly, pets are not appropriate gifts. It’s too stressful for the pets, and a live gift may not be 100% welcome at this busiest time of the year. Read more here! A little extra care and attention will make this holiday season a safe and happy one for the whole family!